Why do coal and oil companies want to export fossil fuels, particularly to Asia? Usually the industry message has been about "energy independence" for the U.S., so we become less reliant on foreign sources. The idea of exporting fossil fuels has arisen due to the decline in U.S. utilities buying coal for energy, and the large-scale production of Bakken crude oil (see Bakken Oil Shale Basin). In order to keep the unpopular fossil fuel industry profitable, it has to sell coal and refined oil to the huge Asian market (especially China), and the only way to do that is through West Coast ports (see Coal Trains). What does it mean for climate change if the companies have a greater profit incentive to extract more and more fossil fuels for export? In 1975, Congress placed a ban on exporting crude oil in the wake of the Energy Crisis during the 1973 Middle East War, to ensure that the U.S. maintains energy independence from foreign suppliers, and to guarantee stable business for U.S. oil refineries (Palmer). But as the glut of oil from the Bakken Oil Shale Basin has grown, Congress lifted the ban in 2015 (Associated Press). The lifting of the ban on crude oil exports could increase the numbers of oil trains and pipelines (Center for American Progress). All oil companies do not necessarily agree on lifting the ban. Most of them want to make quick profits by exporting crude oil to Asia, but others are worried that they will lose refining income to Asian refineries (Palmer). Nicole Fernandez interviewed Eric DePlace, policy director of the Sightline Institute in Seattle, a regional think-tank that works on a range of sustainability issues, and focuses on coal and oil shipping through Pacific Northwest ports. He explained that the lifting of the export ban may vastly increase oil traffic through the Pacific Northwest. When oil prices rise again, “it’s likely that we would see some volume somewhere between a small amount and a huge amount flowing through the Pacific Northwest on its way to Pacific markets, outside of the United States, and so it’s not implausible that…you could see oil by rail or potentially even by pipe move into the Northwest and then shipped to markets in Asia, provided the economics are there for it…. It’s not surprising that the oil industry is backing the lifting of the ban and acting fairly aggressively about that. It’s not probably in American consumers’ interest, and it’s definitely not in the interest of the environment” (DePlace). Although U.S. fossil fuel exports would go throughout Asia, the main destination would be the growing economy of China. Smog Alert in Beijing (Credit: The Telegraph). China is the world’s largest consumer of energy with one-fifth of the world’s energy demand coming from China. About 91% of its energy comes from burning fossil fuels, with 80% consisting of coal. Energy consumption in China is growing four times faster than that of the rest of the world (Dupont). Energy and growth are tied together in the capitalist model, which assumes that the more energy you have, the faster that your economy can grow. The Chinese economy “experienced astonishing growth in the last few decades that catapulted the country to become the world's second largest economy” (Focus Economics). Growing Asian markets have both big rewards and big risks. The Chinese demand for oil is not as high as oil industry originally thought, therefore the supply has become too large. Coupled with the drop in oil prices, this miscalculation has created serious losses in the Chinese energy industry (Spegele). China’s slowing economy, the growth of U.S. oil fracking and the global oversupply of oil have weakened the Chinese oil industry (Gloystein). The level of debt in the country is also growing (CKGSB Knowledge). Nate Boatright interviewed Dong Liansai, Climate & Energy Campaigner at Greenpeace in Beijing. He asked about air pollution in Chinese cities, how China is using energy in its periods of economic growth and downturn, the need to cap Chinese coal emissions, and how the country is turning toward a renewable energy future. China’s push to clean energy is spurred on by the country’s growth of resource and economic stability in the last decade. This allows China to invest more money into clean energy. 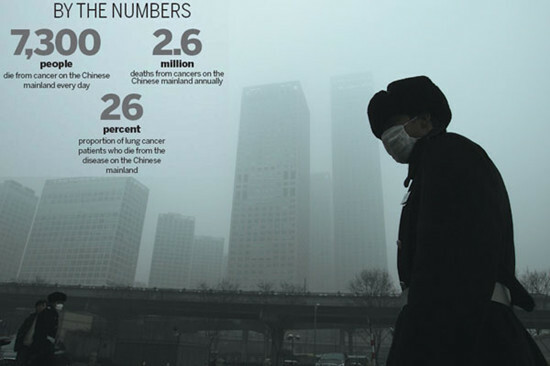 Air pollution is a pressing issue in China, largely because of coal emissions. CNBC reports that “air pollution in China kills about 4,000 people every day, about 17 percent of all deaths in China” (Ferris). A website track the daily Air Quality Index in cities around the country (AQICN). Greenpeace East Asia researcher Dong Liansai described the January 2015 air pollution emergency in Beijing as closely linked to coal burning. The skies finally cleared when industrial coal emissions were temporarily curbed, so he concluded that “Capping China’s coal consumption on a national scale is a key step in securing healthy breathable air for the Chinese public—no matter where they live—and turning blue skies from an occasional treat to an everyday reality” (Dong 2015b). Zhi Xiuyi, a leading expert in lung cancer treatment and vice president of the Chinese Association of Thoracic Surgeons stated that medical authorities used to focus on tobacco control to try and prevent lung cancer but have come to discover that air pollution is “no less harmful” than smoking. In a report that was released by Zhi’s research team, it is indicated that the cancer rate in Beijing is closely related to industrialization, showing that the number of cancer patients in the capital has increased over the past decade. Beijing’s main area of industrialization, the Chaoyang district, has the highest incidence of cancer with four in every 1,000 residents having some form of cancer, with lung cancer at the top of the list. Zhi states, “If one breathed in air with a PM2.5 level of between 200 to 300 five days a week, it might only take five years for the potential for cancer to rise to a dangerous level” (Yang & Quanlin). Beijing has been hit by severe smog and haze, prompting fears about the high levels of PM2.5 (Credit: Wang Jing/China Daily). A quarter of PM2.5 primary emissions in the Beijing-Tianjin-Hebei area, home to over 100 million people, are due to coal burning. Coal burning is also responsible for 82% of sulphur dioxide and 47% of nitrogen oxide levels. Falling levels of coal consumption and the closing of coal burning power plants around Beijing correlate with improving air quality levels (Greenpeace East Asia). Greenpeace conducted a study of emissions in Jiangsu and Hebei, and found how these provinces have been are breaking the law and how this may make future carbon emission reduction goals less possible (Dong 2015a). Beijing on a good day and a bad day (Credit: Facts and Details). China’s use of coal has dropped, and the country is seeking opportunities for growth in Green Energy, particularly in wind and solar. In 2014, fossil fuel power decreased by 0.7%, while power generation from non-fossil-fuel sources increased by 19%. China invested 56.3 billion dollars into renewables in 2013 alone, part of its long-term plan of investing 473.1 Billion in 2011-15. Ningxia province has become the most renewable province in China (Perkowski). China generates “most of its electricity by burning fossil fuels, just as every rising economic power has done since the Industrial Revolution. But to focus on this single fact risks overlooking a notable trend. The Chinese system of power generation is turning green – far more quickly than any other system of comparable size on the planet….Remarkably, nuclear energy played only a small role in this change. Electricity generated by strictly green sources – water, wind, and solar – increased by 20%, with the most dramatic growth occurring in solar power generation, which rose a staggering 175%” (Mathews & Hao). Mathews and Hao explain in China’s Green-Energy Revolution, “The second area in which the green trend has become apparent is China’s total electricity-generating capacity. The country’s power system is now the world’s largest, capable of producing 1.36 terawatts, compared to the United States’ one terawatt” (Mathews & Hao). China’s investment in clean energy (Credit: Dupont). Eric De Place observed that the Pacific Northwest “is in a pretty unique position right now and it’s because we are basically in this pinch point between the big fossil reserves and the interior of the continent and the worlds hungriest energy markets in Asia. So we're either about to be steamrolled by a huge number of coal oil and gas projects, or the region is going to deny the permits for these projects and in doing so end up locking up a huge amount of carbon into the ground and also deal a pretty serious political blow to those industries….These are decisions that will be made within the next year or two, so the time really is now. You have a relatively small state like Washington [that] has not historically been a major player in world energy markets, and right now the potential impacts that arise from decisions here are enormous on both sides of the Pacific for the world’s most veracious and destructive industries…It’s appropriate for us to have a sense of urgency about what happen here these are not just decisions about local impacts although those impacts are real but these are decisions with I think with global consequences” (DePlace). Associated Press (2015, Dec. 22). Lifting U.S. oil export ban prompts cheers, some fears. AQICN. Beijing Air Pollution: Real-time Air Quality Index (AQI). DePlace, Eric (2015, Dec. 2). Interview with Nicole Fernandez. Ferris, Robert (2015, Aug. 18). China air pollution far worse than thought: Study. CNBC. CKGSB Knowledge (2015, Sept. 7). China's Economic Slowdown: The Real Worry Is Debt. Forbes Asia. Focus Economics (2015). China Economic Outlook. Dong Liansai (2015a, April 24). A Progress Report on China's Air Pollution Action Plan. 85% of Heavy Industry in Hebei, Jiangsu Exceeding Emissions Cap. Greenpeace East Asia. Dong Liansai (2015b, Oct. 15). 137 Shades of Grey: Why China Needs a Coal Cap. Greenpeace East Asia. Dupont (2013). Sustainable Energy for a Growing China. Gloystein, Henning (2015, Sept. 15). Oil Prices Mostly Steady, but Weak Asian Economy Weighs. Reuters. Greenpeace East Asia (2013). Tracing Back the Smog. Source analysis and control strategies for PM2.5 pollution in Beijing-Tianjin-Hebei. Huang Wei (2013, Oct.). A Fierce Fight: GDP Versus Clean Air. Greenpeace magazine. Mathews, John A., and Hao Tan (2015, May 8). China's Green-Energy Revolution. Sustainability & Environment. Project Syndicate. Palmer, B. (2014, Dec. 11). Whatever Shall We Do with All this Extra Oil? OnEarth/Natural Resources Defense Council. Perkowski, Jack (2014, June 17). China Leads In Renewable Investment -- Again! Forbes. Spegele, Brian (2015, Oct. 5). China’s Slowing Demand Burns Gas Giants. Wall Street Journal. Yang Wanli & Qiu Quanlin (2013, March 19). A new environment for fight against pollution. China Daily.